So I went back out to the Auction Company on the other side of Atlanta yesterday and pick up my new lot of games! They all have some wear on them. The Pacman cabinet is the worst of them all, and I think that it may have been an outdoor unit at one point due to all of the humidity damage to the wood. The Ms Pacman has some water damage on the bottom but the rest of it is in pretty good shape. The Frogger cocktail is missing the glass, and the wood veneer and the black veneer both need to be replaced, but it is all intact and working. Overall, not a bad little haul. For the Ms. Pac, you can cut off the rotted wood and use a biscuit joiner to add new wood. Cleveland, GA. It is an all day event for me to go up and get them and back. Any idea on where I can find the Frogger Cocktail CPO artwork? Rather than start a new topic, I thought that I would just reply to this one I made. I went to a Warehouse clearance sale of arcade machines just south of Chattanooga. It was awesome seeing so many machines in one place, but I only left with two of them. Both relatively empty, but in good shape cabinets. 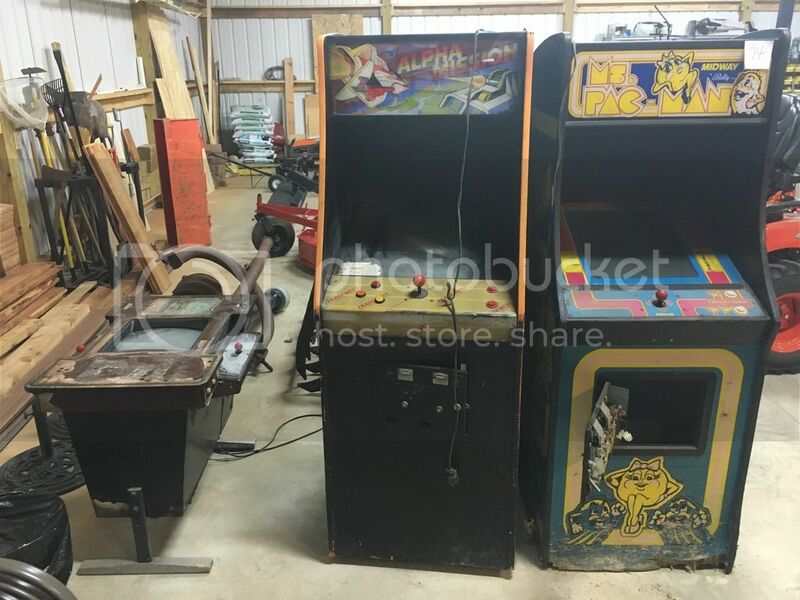 One was a Galaga with no water damage, and the other was a blue Nintendo cabinet that used to be a Donkey Kong. The Galaga cabinet is going to become a Class of 81 machine, as I already have that board, and I always wanted that machine. The other will become a Fix It Felix Jr machine with every Nintendo game I can put on it with it. It should be a hoot to play! And unlike most of my projects, I plan on keeping these two forever! Nice... I need a new project... I am jealous! Thanks! I am stoked to finally get these two cabinets in such great condition. And to get to add these to my lineup will be awesome!